Last Chance for Peace in Syria? The new UN envoy has a near impossible task. But Washington must support it—arming the rebels will only prolong the civil war. 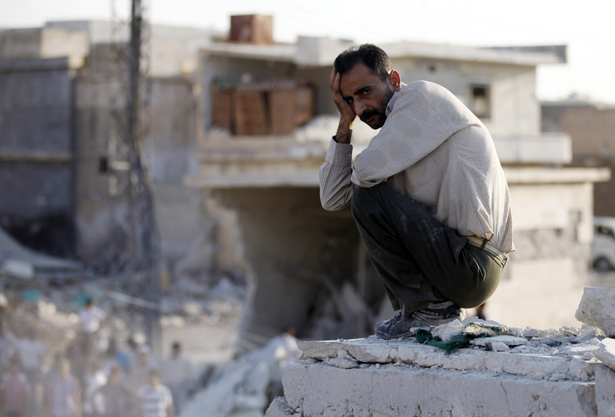 In Syria, our worst fears are becoming a reality. Over the past few months, the conflict has descended into an ever more violent civil war, fueled increasingly by foreign-supported Sunni Islamists on the one hand, and by ruthless pro-regime militia groups on the other. The Assad government is still able to deploy a large military force, but other state structures are collapsing, and the danger of “Lebanonization”—with different parts of the country controlled by different militias, as occurred with Syria’s western neighbor in the 1970s and ’80s—is growing. Even more worrying, Syria has become the epicenter of a regional Sunni-Shia conflict, with Saudi Arabia and Qatar facing off against Iran, Syria and Hezbollah, now the dominant force in Lebanon. Adding to this explosive mix on the Sunni side are a resurgent Turkey, which seeks to expand its influence in the Middle East by emphasizing its Islamic credentials, and an Iraq that has been tilting toward Iran and Syria. If this conflict is not curbed, it could engulf all of Syria’s neighbors, including Jordan and Israel. It is under these alarming conditions that the new UN special envoy to Syria, Lakhdar Brahimi, will assume what some are calling the mission impossible of finding an end to the crisis. If Brahimi is to have any chance of success, he will need a less divided Security Council and the cooperation of regional powers like Turkey, Iran and Saudi Arabia. In announcing his resignation, Brahimi’s predecessor, Kofi Annan, argued that Security Council divisions had prevented the kind of united approach needed to halt the fighting. The appointment of Brahimi would be an appropriate time for the Obama administration to re-examine its flawed strategy of ever more actively and unconditionally supporting the Syrian rebels—one that has been pushed by a chorus of both conservative and liberal hawks. Obama has signed an intelligence finding authorizing the CIA and other agencies to assist the rebels, and the administration has been working with the Saudis to channel money and supplies to rebel groups. More recently, it has created an operational center with Turkey to aid the Syrian opposition and is reportedly considering the establishment, also with Turkey, of a no-fly zone to protect Syrian civilians and help the opposition overthrow the Assad regime, much as it did to help the Libyan rebels topple Qaddafi. Some advocates of a no-fly zone may honestly believe we would be able to replicate the air campaign in Libya, but the evidence increasingly suggests that rather than paving the way for a democratically determined replacement of Assad, we would only push Syria further down the road of prolonged civil war, with radicalization of all sides on the scale of Afghanistan or Lebanon in the 1980s. Rather than weakening the resolve of the Assad regime, the American-Saudi-Turkish approach has hardened its determination. And as the conflict has taken on a more sectarian character, the sides have become locked into all-or-nothing positions, with the more extremist Sunni groups determined to wipe out the regime and its supporters, and the regime’s constituent groups—the Alawites, primarily, along with some Druze, Christians and Sunni bourgeoisie—ever more fearful of rebel reprisals and therefore convinced that they have no choice but to fight to the finish. This zero-sum tendency has been reinforced by the Saudi agenda, which is to bring about a sectarian reordering of Syria with a view to changing the balance of power in the Middle East. It will be very difficult for the Brahimi mission to halt this drift toward greater violence. But given the stakes for the region, it is incumbent upon the United States to give the UN effort its full support. Much of the US media blamed Russian and Chinese intransigence for the collapse of the Annan mission. But as veteran Guardian reporter and Syrian observer Jonathan Steele has pointed out, it was US, Turkish and Saudi policy as much as Russian and Chinese vetoes that led to the collapse of the Annan plan. The US demand that Assad be removed and sanctions be imposed before negotiations could seriously begin, along with the refusal to include Iran in the process, doomed that mission. Any diplomatic approach that excludes Russia and Iran will be similarly condemned to failure. For many years, Washington has sought to undermine the Iran-Syria-Hezbollah “axis,” but it has been a mistake for the Obama administration to tie its Syria policy so closely to the Saudi and Turkish positions. Saudi Arabia, in particular, has an anti-Shia Islamist agenda that is antithetical to democracy, open government and the rights of minorities everywhere. American policy should be to curb the extremist tendencies of our “allies” and soften sectarian divisions, not exacerbate them. In Syria, that means working toward a cease-fire, followed by a power-sharing arrangement that avoids retribution and provides guarantees for the rights of minorities. Having worked in Iraq and Afghanistan, and more importantly having negotiated the 1989 Taif Accords that ended the Lebanese civil war, Brahimi understands the importance of these basic principles. The United States must give him the support he needs to pull Syria back from the path of destruction.